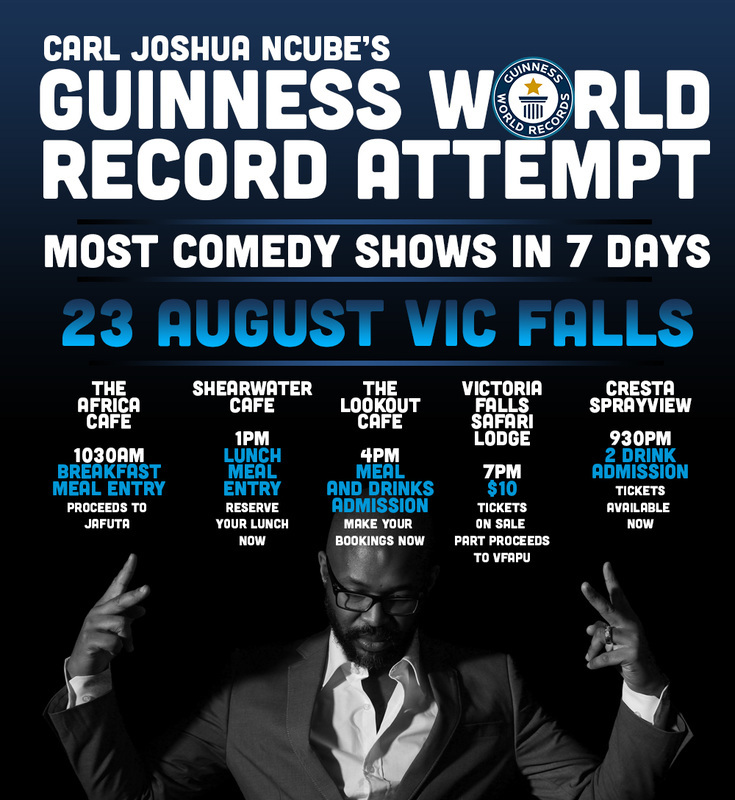 Victoria Falls will have the honour of hosting Zimbabwean comedian Carl Joshua Ncube while he attempts to break the Guinness World Record for the most comedy performances in 7 days. 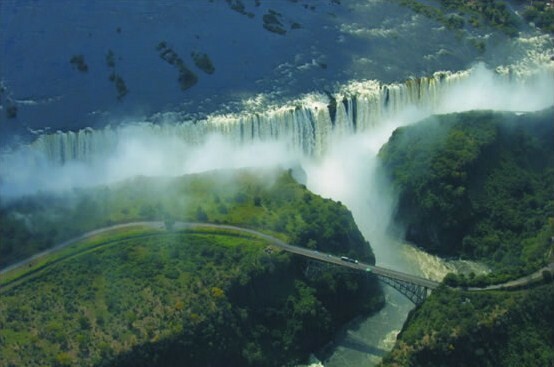 Mr Ncube's #BreakTheWorldRecord tour is an endeavour to get Zimbabwe noticed on the international platform, and for more positive aspects of Zimbabwe. The record for the most shows in 7 days is currently held by Australia's Mark Murphy, who did 30 shows in 2007. This record is for the greatest number of comedy gigs performed at different venues within one week. This record is to be attempted by a comedy act. For the purposes of this record a comedy gig must be over 30 minutes in length and given before a paying audience (in receipt of printed tickets) in a recognised venue, which normally stages comedy nights. Each concert must be given before a paying audience (in receipt of printed tickets) in a recognised venue, which normally stages comedy nights. The venue can be a theatre, conference or community centre, exhibition hall, public hall, or public house with a capacity for a seated audience. As an alternative, a stadium registered for staging concerts and similar events may be used. Tickets must be advertised and available for sale to the general public through the usual outlets. The concerts should be accessible to members of the press for the purposes of standard reviews. Each gig should last at least 30 minutes from start to finish, and should be planned and rehearsed in advance. An encore may be included in the time-frame. The performers should be paid. The gig should be of a professional standard and of a similar content to the usual act performed by the individual attempting the record. The tour will mostly be around Zimbabwe, plus a few shows in Johannesburg and Cape Town, South Africa. Mr Ncube will attempt 35 shows at 35 different venues over the 7 days. As Zimbabwe's "Largest" Comedian, Carl Joshua Ncube has set the pace for comedy in the country. 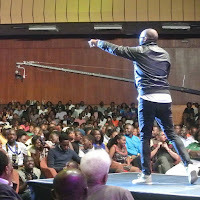 He has toured around the world, rubbing shoulders with comedians such as Basketmouth (Nigeria), Donovan Goliath (South Africa), Eric Omondi (Kenya), Kansiime Anne (Uganda), and Late Night's Trevor Noah (South Africa) to name a few. 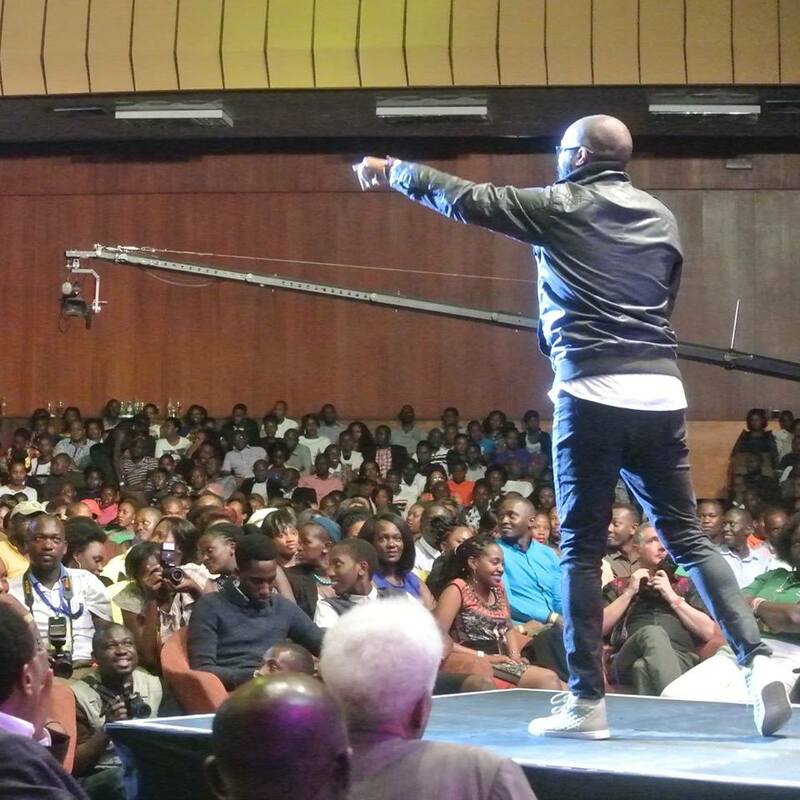 Carl was among the acts that appeared on Comedy Central's International Comedy Festival in December 2015. Mr Ncube is not only a standup comedian - he has a passion for cooking, and hosts a Zimbabwean show called Carl Can Cook, which airs on the national broadcaster, ZBC. Earlier this year, Mr Ncube became part of a duo on a local radio breakfast show The Morning Rush, which airs on ZBC's S-FM.